This mount is the perfect solution to get the Google Wifi off the counter without drilling holes in the wall or modifying plugs. It is very easy to use and it holds the Google Wifi securely.Great for bathrooms and kitchens where counter space is critical! 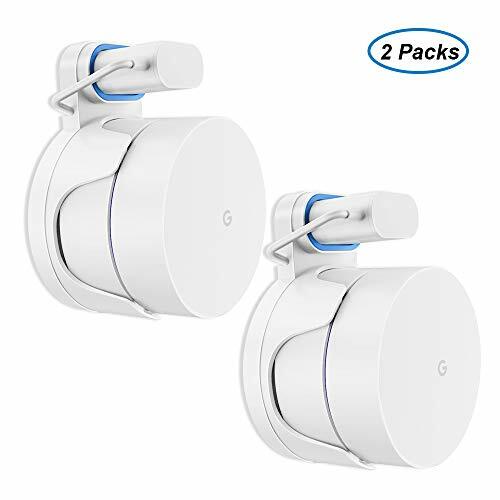 This mount requires no extra hardware as it uses the original power cord that comes with the Google Wifi. - Elegant, Stylish and Minimalistic. Unique Design: This outlet wall holder fit the Google Wifi perfectly and was designed well to hold the unit securely which can be mounted in bedroom, bathroom, kitchen,garages and office as long as there is a socket. Fantastic Cords Management: Wrap the cord around the reel and hide it perfectly on the back of the holder. It helps to save the counter space and keep everything neat and modern. An essential Google Wi-fi accessories that you must have! Secure Fit: Unique anti-slip blue rubber gasket design makes the hook portion fit more snug to the wall plug, which secures your device on wall firmly, makes your device less-likely to be subject to messy spills or cord-related 'accidents'. Convenient and Simple: Any open electrical outlet in your home can become a Google WiFi beacon, making the setup of your network so much simpler. What You Get : 1x Outlet Wall Mount, 1x user manual. 30 days free money back, 18-month warranty and lifetime technical support for all of our valued customers! If you have any questions about this product by Hmount, contact us by completing and submitting the form below. If you are looking for a specif part number, please include it with your message.